It has been almost 2 years since we launched the previous version of the SelectSpecs.com website but what a great 2 years it has been! Not only have we added more prestigious designer brands to our collection including Tom Ford, Roberto Cavalli and Mont Blanc, but we also successfully launched a range of prescription glasses for just £5 including lenses, UV protection, Anti-Reflection and Scratch-Resistant coatings – which we’re proud to say are still the World’s Cheapest Glasses! We’ve made it easier to get around our website and find the items you are looking for. You will now find useful drop down menus with all the important links from each of the main product categories (Glasses, Sunglasses, Accessories, etc), this will allow you to navigate to anywhere on our website with ease. Simply hover over the menu tabs to reveal the menu options. We’ve given our search system a complete overhaul with the addition of some new predictive features which will help you find the product or information page you are looking for without leaving the search tool. 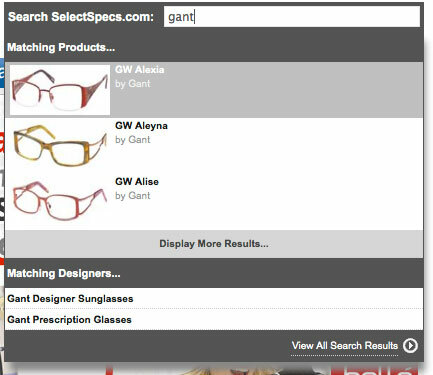 Simply start typing in the name of the item you are looking for and wait for the results to appear! We’ve improved our product value search ranges from the old ‘Budget’ and ‘Premier’ ranges, we’ve now divided our entire product catalogue up into further product values making it easier to find a product suitable for your budget requirements. Finding prescription sunglasses has been made easier, simply select the product category you are interested from our sunglasses section then from within the search results select “Prescription Compatible Sunglasses Only” from the Show Me… drop down box. The results displayed will now only show sunglasses that are suitable for prescription lenses! Images of products will be improved over the coming months with each option image displaying upon selection – This should ultimately make it simpler to purchase the option you require. We have now added real time stock availability to our website, any products that are out of stock will be marked as ‘Currently Unavailable’. We are now able to offer alternative frame sizes with many frames being available in up to 3 different sizes, small, medium and large. Sizes are presented in the following format: 135-18-46-32 = 135 (Arm Length) 18 (Bridge Width) 46 (Lens Width) 32 (Frame Height – This value may be N/A if we do not have this information). Please note, if a frame size is unavailable we will display “Currently Unavailable” next to the item. 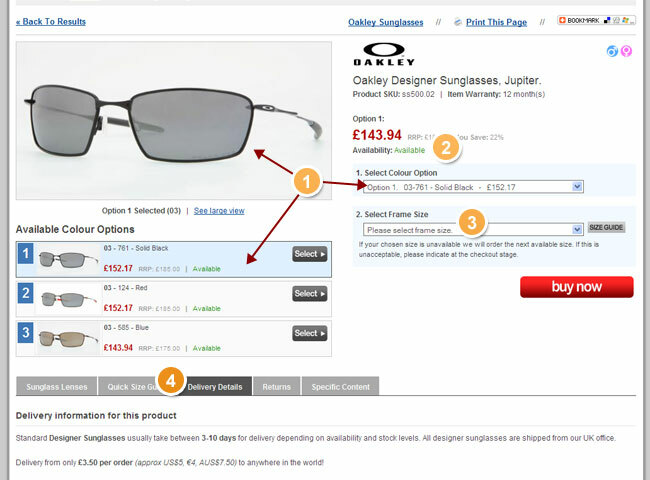 More information about the product, delivery and returns will be displayed below the product in a tabbed area. Q. Will I need to create a new account? A. No, all existing account have been carried across to our new website so you will not need to create a new account. Q. The currency is wrong, how can I change this? A. Simply select the correct value from the Currency selection drop down box in the top right hand corner of your screen. Q. Do you have anymore developments planned? A. Certainly, we never stop coming up with new ideas here! At the moment we have a nifty new prescription system in development that we plan to have online later this year. Q. Are you adding any new designer ranges? A. Yes we are! We’re proud to say we recently acquired the Oakley Sunglasses and Oakley Prescription Glasses ranges, these will be available from immediate effect – All Oakley sunglasses that are available on our website are available for shipping within 24 hours of ordering. If an item happens to be unavailable, please drop us an email through our contact system and we can advise you when that product will be back in stock. We also have a number of new ranges coming online shortly including Jimmy Choo, Calvin Klein, CK Calvin Klein, Nike and many more! Q. I’ve discovered a bug that needs fixing. A. Great! Please let us know through our customer services system and we will rectify the issue as soon as possible. Please bear in mind that with any changes there is likely to be a transition period so banners, logos, or text may look incorrect for a period of time but we are working to correct these issues!